The original intention for this fabric and wonderfully matching buttons was a Tilly and the Buttons Miette skirt with button tabs instead of the waist ties along the lines of this. 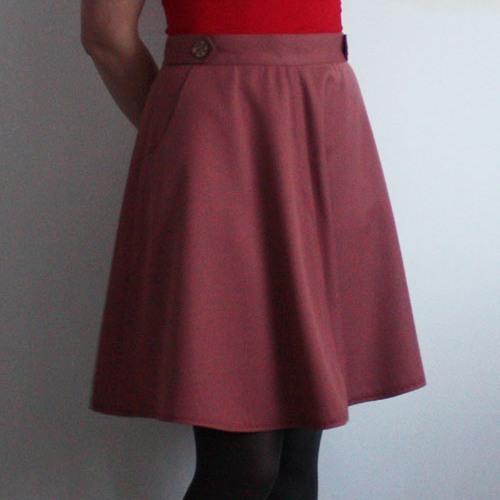 However, when Sewaholic started converting their existing patterns to PDF, I decided to make things easier for myself and go with the Hollyburn skirt which had everything I wanted from the skirt already in the pattern. I purchased the PDF and starting putting it together within 24 hours of release! Since the skirt is only fitted at the waist, I didn’t make a toile. It fits pretty good although if making again I’d probably change the waistband so it is slightly curved as I’m generally not so keen on the look of straight waistbands on me, maybe because I tend to prefer wearing skirts lower than my natural waistline. I went with view B for the length/flare as well as the button tabs. I thought it was likely I’d want my skirt a bit shorter than this, but view C looked likely to come up too short on me given my height. I ended up cutting 6.5 cm off the hem and using a 2 cm hem allowance. The fabric is a lovely soft cotton drill/twill (I’m not quite sure of the difference yet!) 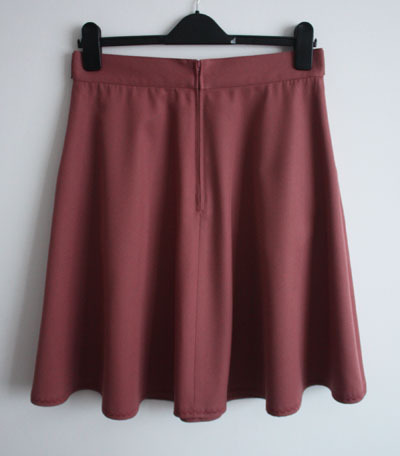 from the same shop on Goldhawk Road that I got the fabric for my Miette skirt. The buttons are from John Lewis – I was so chuffed when I found them as the small bit of pink is a near perfect match to the fabric colour. I decided to try top stitching instead of slip stitch around the waistband. I’ve seen a tip on a few blogs to use a blind hem foot to help keep the stitching even. This worked a treat and as a bonus means I’ve now used all the feet that came with my sewing machine! Another first was inserting a regular, centred zip (I’d only used invisible zips previously). I didn’t practice on a scrap beforehand and did end up unpicking and starting again, but that was more me being a bit picky and thinking I could do better rather than there being anything especially wrong with my first attempt. To finish off I decided to use one of the decorative stitches on my machine while hemming. 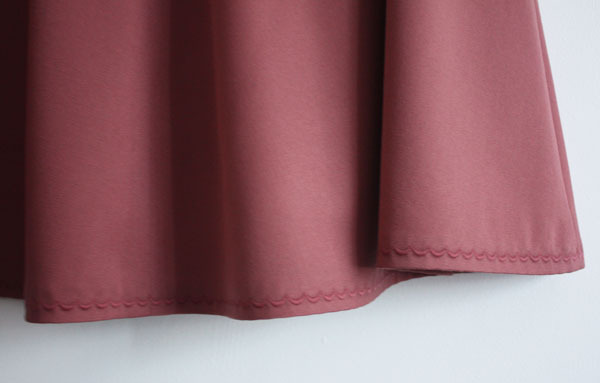 There’s something about decorative stitching in a shade to match the fabric that I quite like – maybe it is the added texture or maybe it just feels a bit more luxurious. Given the width of this hem, I was quite happy to be finishing it by machine! Overall an enjoyable make resulting in a skirt I can definitely see getting a good amount of wear. 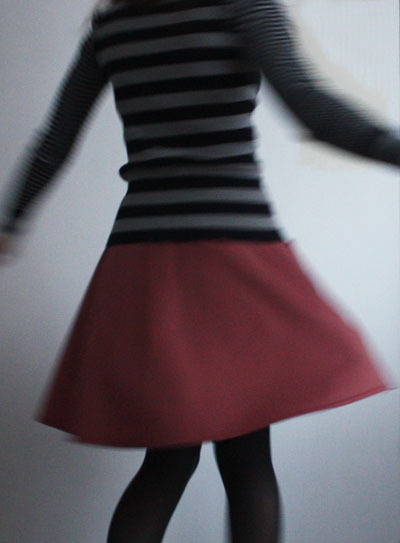 And to finish, I couldn’t resist trying out a twirling shot, partly to see how much the skirt flared, but mainly just for the fun of it! Such a pretty colour and the buttons are a perfect match! Your top-stitching looks brilliant too. Thanks Caroline, I was so chuffed when I found the buttons!